Blizzard Conditions Hit New England As Massive Winter Storm Travels North : The Two-Way As the "bomb cyclone" intensifies, visibility has dropped to nearly zero in some sections of the snow band. 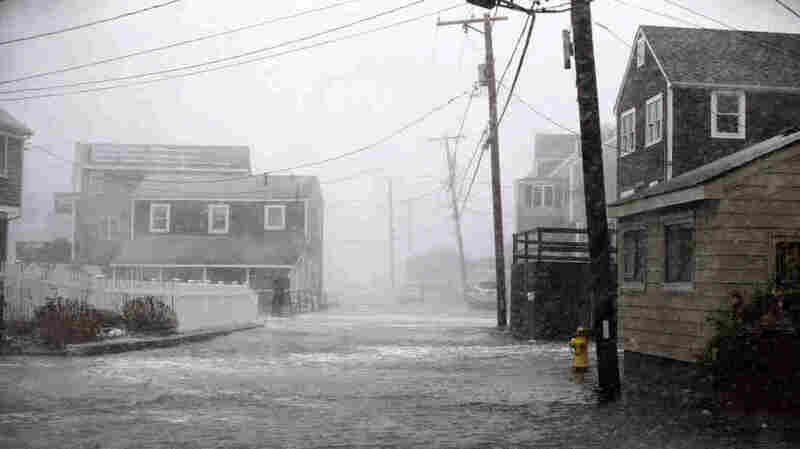 Serious flooding and hurricane-force winds have been observed in coastal Massachusetts. Airplanes wait at the gates outside Terminal 5 at John F. Kennedy International Airport in New York City on Thursday. 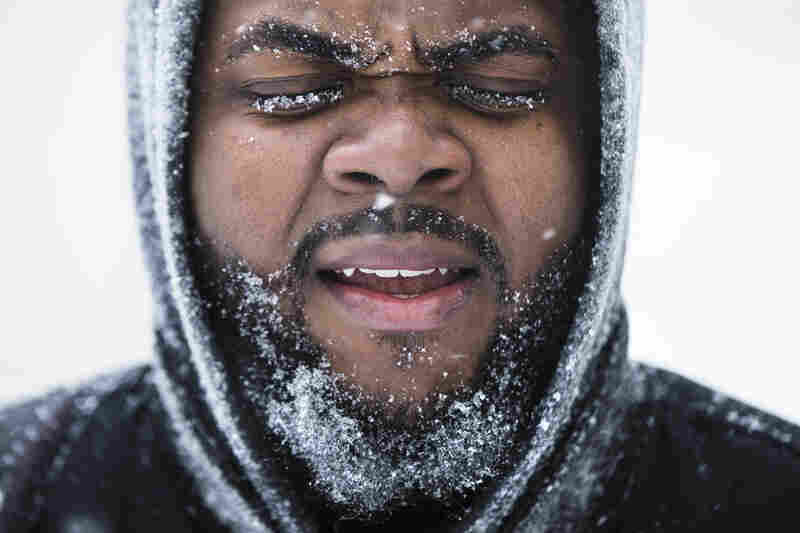 Ajamu Gumbs makes his way to a bus station in Atlantic City, N.J. A winter storm is traveled up the East Coast. A woman clears the steps in front of her home in Boston. Nora Hughes walks her dog, Potato, down Newbury Street in Boston. 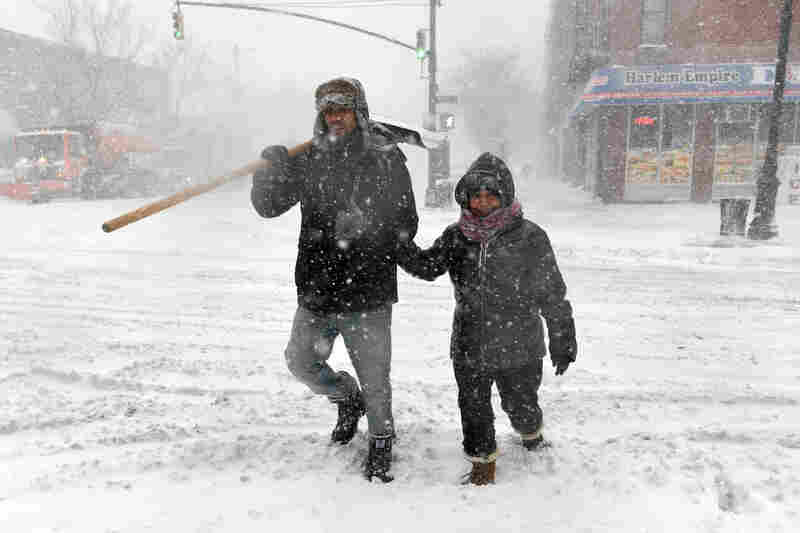 Pedestrians cross the street in Harlem during a snowstorm. As a major winter storm moves up the Northeast corridor, New York City is under a winter storm warning. 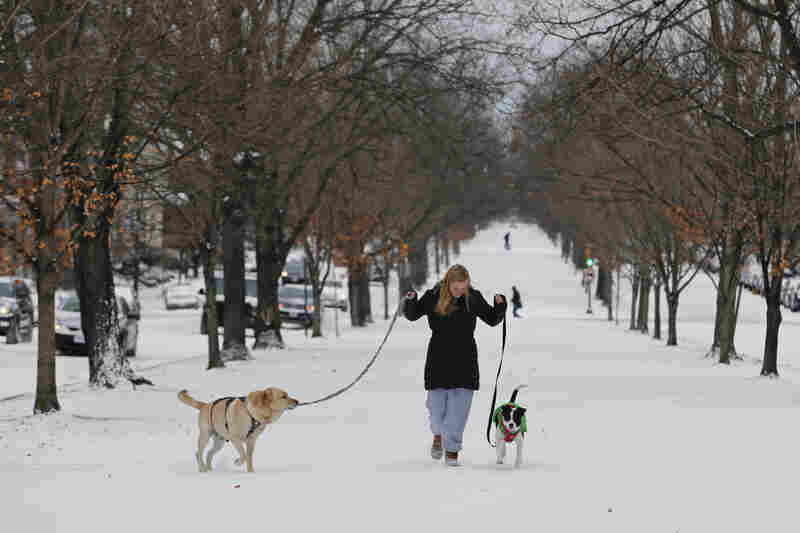 Katherine Reid walks her dogs on the snow-covered median in Richmond, Va. 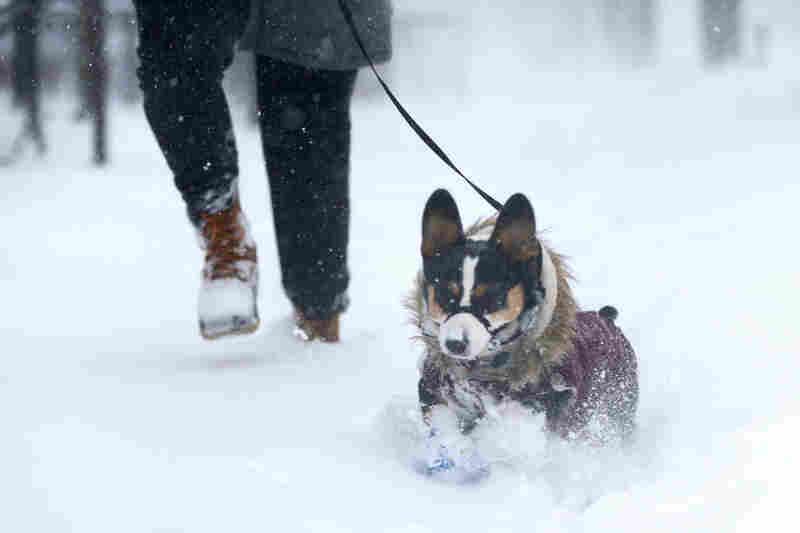 The storm is fueled by intense cold across the U.S., which collided with relatively warm air over the Atlantic. Ornamental plants are covered in a thin layer of ice in Plant City, Fla. Temperatures in central Florida dipped to below freezing. 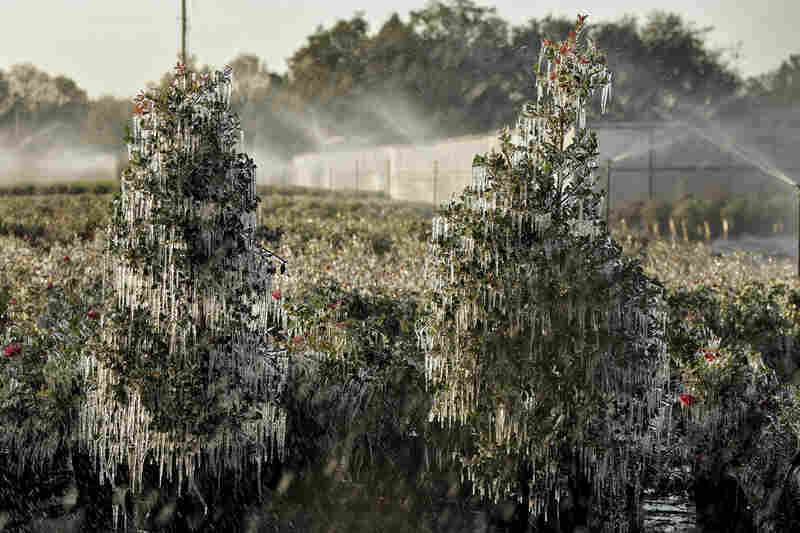 Growers spray water on the plants to help protect them from extreme cold. 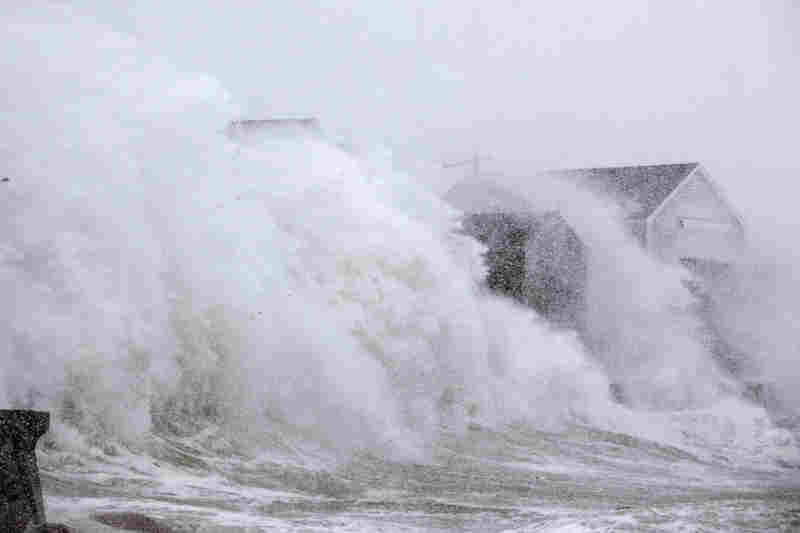 A wave crashes over homes in Scituate, Mass., as a massive winter storm begins to bear down on the region. The "bomb cyclone" is expected to dump heavy snows in New England as the storm system moves up the East Coast. 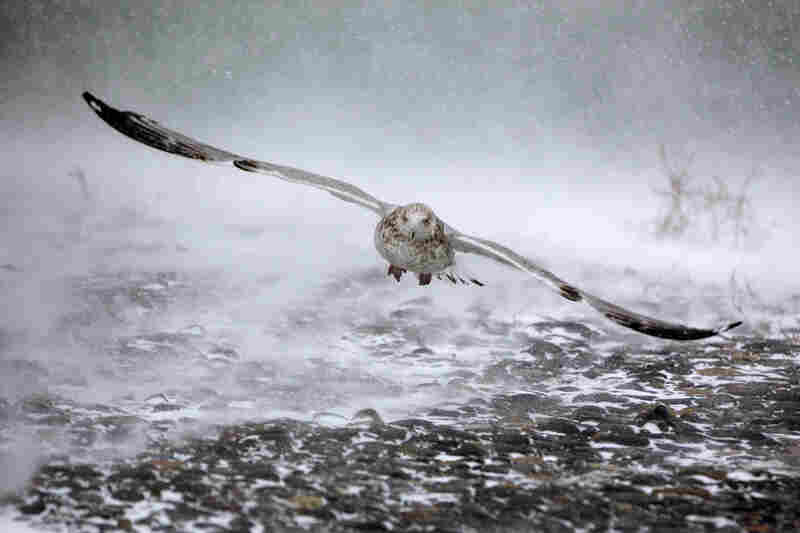 A seagull takes flight in high winds and blowing snow in Hull, Mass. The brutal conditions in the Northeast come one day after the same storm system brought wintry weather to the South. 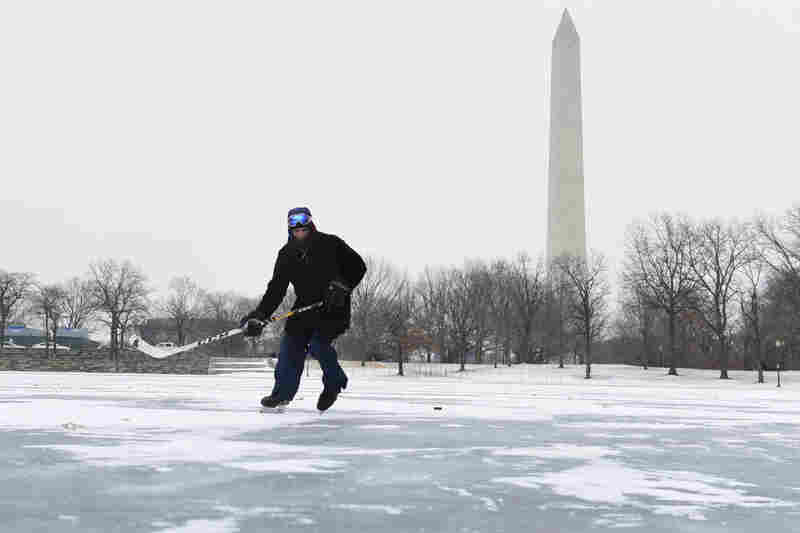 Fabian Olaya plays hockey on a pond near the Washington Monument in Washington, D.C.
A massive winter storm has brought hurricane-force winds, blizzard conditions and damaging coastal flooding to eastern New England, one day after it delivered unusual cold and snow to the South. The National Weather Service says snow in the Northeast will end Thursday night, but it will be followed by strong winds and arctic air "resulting in dangerously cold wind chills" throughout the weekend. Wind gusts of more than 70 mph were detected in some places in New England, according to The Associated Press. High winds are expected to increase the possibility of power outages. "Blizzard to near-blizzard conditions will likely persist into the evening hours from eastern Massachusetts to Maine," the weather service says. A road begins to flood in Scituate, Mass., during a massive winter storm on Thursday. The storm has caused four deaths in North and South Carolina and another in Pennsylvania. Reuters reports the cold snap across much of the country has killed more than a dozen people. Coastal Massachusetts is also experiencing "major and destructive" flooding, brought by a combination of high tide and waves from the storm, the Weather Service says. Some roads have become impassable. "In Scituate, the National Guard was deployed after the town's sea wall was breached along Oceanside Drive. Local officials in Plymouth, Marshfield, Eastham, and Chatham — among other communities — reported flooding described as 'major.'" According to the National Weather Service in Boston, the city may have set a high-tide record, although it will need to be confirmed. The Globe reports that some Boston train stations had to be shut down because of flooding, which affected multiple streets in the city's downtown. Large chunks of ice were seen on a downtown street. "Qizuyu Fan, who hails from a Chinese city near the border with Russia, said Thursday afternoon he wasn't fazed by the tough weather. It's nothing compared to what he's had to deal with at home, where temperatures are often well below zero in the winter, he said. "The 21-year-old Boston Children's Hospital research student was out getting groceries but planned to spend a good part of the day playing in the snow." Meanwhile, NWS Boston advised residents, "We do not recommend going out and floating on icebergs; this is a very dangerous situation along the coastline with major flooding ongoing." As the snow began tapering off, Weather Service officials tweeted warnings to residents to shovel snow safely, check batteries in carbon monoxide and fire detectors and clear snow and ice from vents outside of homes. The "bomb cyclone" that bludgeoned New England is a powerful storm, bringing bitter cold and heavy snow. The rate at which the storm has intensified is unusual — the Capital Weather Gang at The Washington Post called it "astonishing." A storm can be classified as a "bomb cyclone," or a particularly fast-forming storm, if the pressure drops 24 millibars in 24 hours. This storm has more than doubled that pace. "This storm's pressure tanked 53 millibars in 21 hours (and 59 millibars in 24 hours), which puts it into the upper echelon of the most explosive East Coast storms ever observed — and perhaps even at the top," the Post writes. 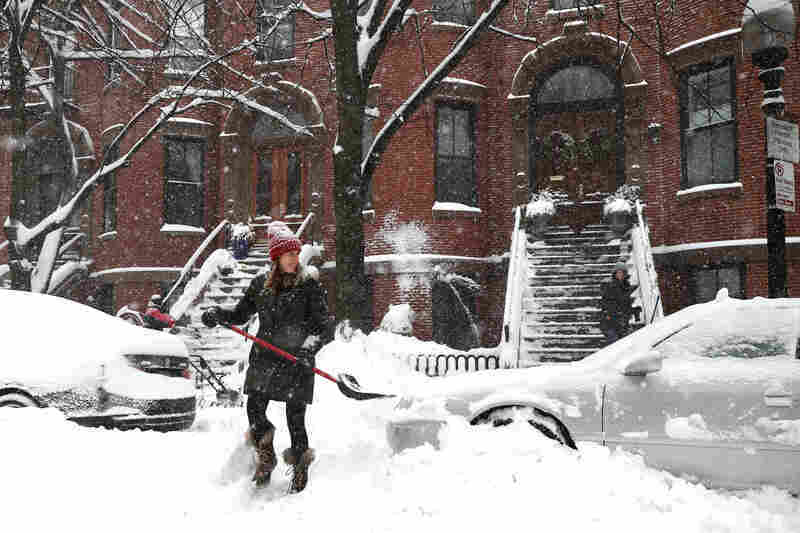 The NWS in Boston calls this storm "impressive, explosive" and "high-impact." 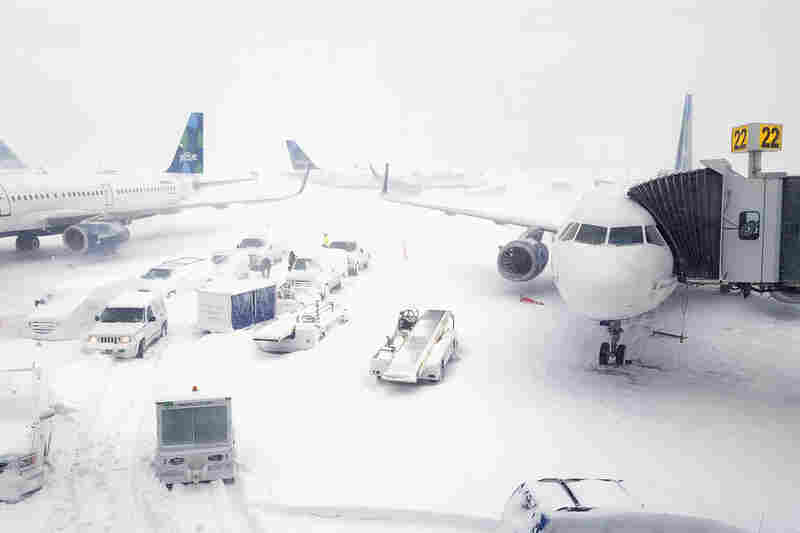 Thousands of flights have been canceled. Across the Northeast, schools are shuttered, salt has been spread, and local officials are pleading with residents to stay off the streets if they can. There is near-zero visibility in some of the snow bands passing over the states from New Jersey to Maine, the weather service says. "Winds with gusts as high as 75 miles per hour are forecast for some areas. That brings the risk of power outages from downed power lines. Malloy says wind conditions may make it difficult for utility workers to quickly restore power." "The city's Department of Education is shuttering schools all day Thursday as the powerful nor'easter moves through the New York/New Jersey region. Many area schools are closed for the day. "At the same time, Mayor [Bill] de Blasio is urging people not to drive and to minimize their time outside.
" 'Bottom line is to take this storm very seriously. Very cold temperatures — definitely a major amount of snow — could get to be a lot more. Wind gusts up to 40 miles-per-hour — this is serious stuff. Asking all New Yorkers to take precautions. Lookout for your neighbors as well,' de Blasio said."